AAH, CHIVE BLOSSOMS. I think the lavender-pink petals are delicious when sprinkled over salads, pastas and other foods which benefit from a hit of onion. The flowers are in bloom for only a short time (here, mid-May to mid-June). But you can enjoy their unique taste and beautiful color all year long if you make a simple infusion called Chive Blossom Vinegar. 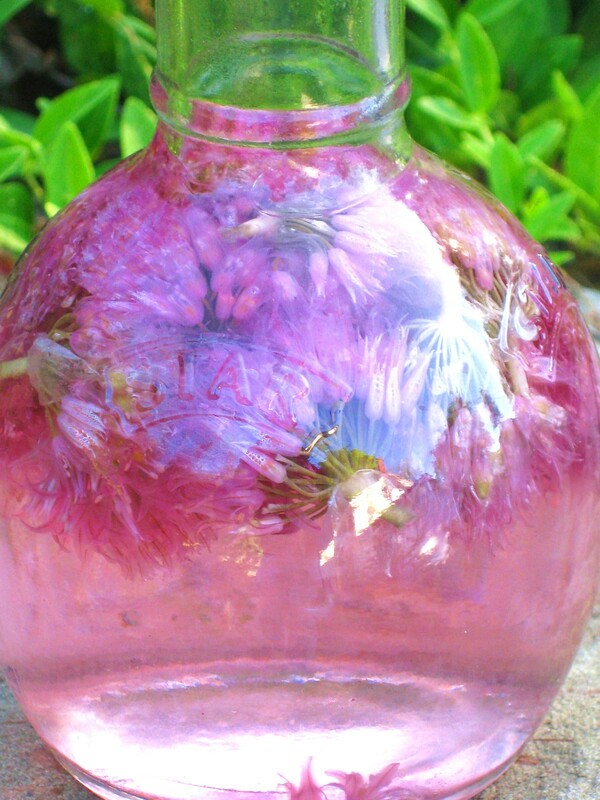 Place the chive blossoms in a sterile jar, then add enough vinegar to cover the flowers. Cover with a lid. Set the jar outdoors in the sun. In about 24 hours, the vinegar will turn a lovely blush tone. After two weeks, a deeper pink color and a wonderfully intense onion flavor will develop. * At this time, strain out the blossoms, and decant to a beautiful jar. *Last year, for the sake of experimentation, I gave the concoction only one full day of direct sun. Then I brought the bottle indoors to a dark cabinet. The rich color and deep flavor developed perfectly well in the dark location. As you might imagine, Chive Blossom Vinegar makes a welcome host or hostess gift. My bottle, pictured up top, will be given to the friends who are hosting me for dinner tonight. Because the batch is newly made, I’ll leave the blossoms in the bottle. A gift card, tied to the bottle with raffia, will advise my hosts to remove the blossoms when two weeks have passed. Think you’ll make this elegant elixir before your chive blossoms are history? Trust me, on some cold, snowy day in winter you’ll be glad to have this little reminder of spring. I find that when I make a dressing of Chive Blossom Vinegar and olive oil, no other seasonings are required for my salad. Kevin, this looks AND sounds delish! My chives are only now coming into bloom. I'm in a colder zone than you. Ohhh I hope I'm not too late to try this. I used to make all kinds of herbal vinegars-must get back to it. Hopefully my chive blossoms aren't too spent! Katreader – yes, huuurrrrry!!! It's worth it! The farmer's market had flowering chive stems yesterday, but I didn't buy any. Now I'm hoping they will have them next Saturday so I can make this beautiful brew. Love the color! Boo hoo! My chive blossoms are all dried up! But the vinegar does look worthy of gift giving! I still have some chive vinegar from last year, so I wondered if I could dry the flowers like herbs? Or freeze them? Have you done that before? Terry – My understanding is that the flowers do not retain their scent/flavor when dried. Vinegar is still the best way to preserve the beautiful essence. You are amazing. I absolutely all the things you do! My chive blossoms are in full bloom. I will try this next weekend. Does the lid have to be perfectly sealed, or will any jar do? Pepi Noble – Glad you tried and enjoyed the Hollandaise! snowflake – Great! I think you'll love this chive infusion. Robin – Thanks – You are too kind. despina – Any jar will do, although it should should be made of clear glass (you'll want to see the beautiful pinkish-purple coloring the vinegar takes on). The lid should fit tightly enough so the essence of the chive blossoms doesn't evaporate. A mason jar with lid is fine, as is a perfectly clean wine bottle with cork. Love this idea! I used a pint mason jar and cheap vinegar, but I linked to your post since your bottle and vinegar are so much nicer. Just curious, since I’m the basically lazy and forgetful sort, what harm would it be to not strain out the flowers? Jeanne Collins – After a lengthy period, the blossoms will probably fall apart. So removing them is mostly a matter of aesthetics. Kevin, I started a jar of chive vinegar just a few days ago for the first time. It is just a small jar because I don’t have many blossoms right now. The directions I found said to put the jar in a cool dark place for a couple of weeks and then straining. You put yours out in the sun. Do you leave it out the whole 2 weeks? Is there much difference in the final product do you think doing it one way rather than the other? Your post is beautiful, as always. Thanks. Rosemeri – Unless I’m giving a new batch as a gift, I leave the jar or bottle of vinegar (stuffed with blossoms) out doors for 2 full weeks. As the sun warms the vinegar, the blossoms can’t help but release their pink, perfumed essence much more intensely than had they been left them in some dark, cool place. Well, this has been my experience. Thanks, Kevin. I’m going to try it your way. Oh that’s so beautiful!!! And that’s a beautiful container to keep them in as well! My MIL chive’s are blooming right now… maybe I’ll go over there and make some vinegar for the both of us with them! For cleaning purposes I make citrus-infused vinegar – when she saw my jars sitting on the porch she was enamored at the thought! Donna B. – Yes, snip those chive blossoms while the getting is good. And what a great gift to share with your MIL. Just don’t confuse the chive blossom vinegar with the citrus one, lest your house smell like onions instead of oranges! If you dry the stems, will they lose their onion taste? I’m going out to pick some chive flowers right now! Wonderful idea! I’m off to see if I have a bottle, or buy one. 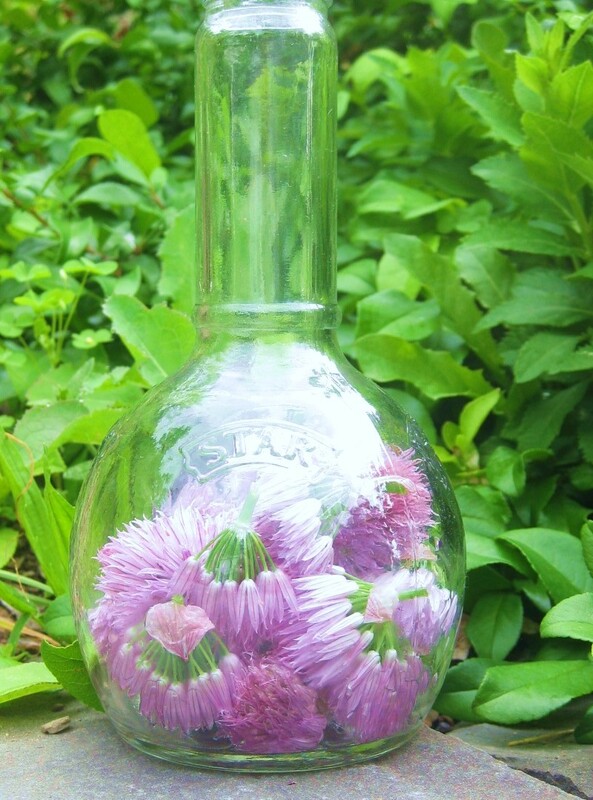 As soon as I saw this I went out and picked some chive blossoms, and even had some of those cute little frappicino milk shaped bottles to put them in. I’ve always wondered if there was something I could use the blossoms for besides looking pretty in the garden. Can’t wait to try the infused vinegar. You always have creative ideas and I love your blog. I love flavored vinegars and what a great idea for gift giving. That’s just the kind of ideas I love. I will try it. Thank you fro sharing. I really want to try this! Couple of ?’s, Do you leave the vinegar out in the sun the entire 2 weeks and how do you store it. Does it last indefinitely? Thanks so much. This is wonderful vinegar and I like your gift idea! Mary Howe – Can’t say for certain, but I suspect the chive blossoms do lose their taste when dried. For Chive Blossom Vinegar, I use fresh blossoms. Gail – Do give it a try! I’ve always let the vinegar/chive blossoms steep outdoors in the sun for two weeks. Probably I’m overdoing it. The goal is a deep pink color, and a rich and full aroma/taste. This could occur in 2 weeks or perhaps just 5 days. Your eyes (and nose) will guide you. After I remove the blossoms, I store the vinegar just as I do my other condiments — in a dark cupboard. The vinegar keeps indefinitely. I LOVE edible flowers and have gotten a big bang recently out of using chive blossoms things I’ve made for a couple bring-a-dish events. How long does your vinegar retain its color? (I’m asking because one of the websites that doesn’t make it in the sunshine says, “Keep this vinegar in complete darkness or the color will fade in a few hours.” – http://herbgardens.about.com) And do you have any recipes or recommendations for how to use the chive blossom vinegar? By the way, I take it you’re leaving it out at night, too, when you make it? And you’re storing it at room temp when it’s done? Thanks Kevin, I am definitely trying this. The chives are just coming into bloom. Any suggestions on where to buy large bottles of the white wine vinegar? Thanks again! Debbie Rhea – The color — at least for me — doesn’t fade in a few days. Yes, while the blossoms are steeping in the vinegar, I leave the vinegar outdoors day and night. As I mentioned in an earlier comment, although I’ve left the vinegar outdoors for 2 weeks, this is not a hard and fast rule. The color and aroma should be your guide. I use Chive Blossom Vinegar in place of plain vinegar for salad dressing. Otherwise, no recipes to report. Gail – You could very well use any white vinegar for this. The bottle in the photographs above actually contained white wine vinegar. I transferred the vinegar to a jar, stuffed the bottle with chive blossoms, then returned the vinegar (1/2 cup) to the bottle. It made a nice, gift-y presentation. Kevin – have you done sweet basil vinegar? Will that work? Diane – Have not tried sweet basil vinegar. But yes, this technique would certainly work with basil. If you use purple basil, the vinegar will turn a nice “royal” shade! I hav’nt been able find white wine vinegar. Regular vinegar. Yes. I could have use it but it wouldn’t be the same. Right? I ended up buying two bottles of what I thought was white wine vinegar but its more yellow tinted so I may not get that beautiful pink look. Where can I get white wine vinegar? Patty – Go ahead and use regular, clear white vinegar. I think you’ll be happy with the results. Cool. Your blog is one of the things I look forward to, I always learn a great deal. Thanks for the photos too. Your raised beds are amazing. Never heard of infused vinegar, but yeah, I’ll try this. I’m excited to see how this looks and tastes. I found some champagne vinegar so I’m trying it! Already pink… and the bottle the vinegar came in is pretty, so I’m just going to get the labels off and put the finished concoction back in there. Thanks! Chuck – What a kind comment – thank you. Hope you’ll make this vinegar. Its taste defies description. Terri H. – That’s exactly what I did — purchased vinegar already in a beautiful bottle. Have you smelled the infusion yet? Get ready for an aromatic surprise! Kevin, This is the second year I’ve done this, but this time I’ve done four jars. Last year I did one jar and gave it away as a gift. I was told it was the best vinegar ever by the recipient. So, I will keep one or two for myself this time and have a couple to give to my very nice neighbors. How cool is it to make a great gift from your very own garden? Very cool. Thanks again! Loved reading all the comments and thank you for all the information. I love discovering new things. So, finally popped open the jar of chive blossom vinegar that I’ve had sitting in the cabinet letting get all yummy since Spring. I used it making a really light and fresh pasta salad and OH MY GOSH is it sooooooo good. With some fresh herbs added from my container garden the salad tastes like Summer. I am definately saving some of the vinegar for a cold February day when thoughts turn to seeds and warmer weather. My garlic chives are just blooming now! Way off schedule. They were covered up by some raspberry canes that had wandered into their spot. Have you ever tried this with garlic chives? the blossoms are white, so I don’t think the vinegar would be as pretty, but I am wondering about flavor. Hi Joan – I think garlic-chive vinegar would be delish. As you said, the only downside is that you won’t get the pretty color. Diane, I have done this with both basil and tarragon. I can’t wait until next spring to try it with the chive flowers. Thanks for your post! I have been making chive blossom vinegar for years and it’s one of my favorites for sure! I actually have bottles of it in my pantry because I make so much. I also love Tarragon vinegar – a huge favorite too. Thanks for sharing such great info!! Just put mine out in the sun!! Thanks so much for the idea!!! Kevin, as usual you keep spoiling us with your amazing recipes. Thank you. Definetaly will make some Chive Blossom Vinegar this year. What do you think about using the unopened chive buds? I pinched them off before making chive pesto, another great recipe from Kevin. And one rhetorical question which you don’t have to answer for obvious reasons. How do you get all these wonderful things done and still find time to answer all the comments you get? This sounds really great. I do have a question, though, regarding safety. You said put this in a sterile jar – should you boil the jar? Is there any danger when creating vinegars? Do you have any guidance on what is safe to add to vinegars? I really love your site – you have such practical and great ideas. I made this last summer and it really is delicious! I can’t wait for my chive blossoms to open. I used it mostly for salad dressing but the mayo I made with it was my best batch of mayo ever. So good on potato salad. oooh thank you for this beautiful thing to make. just put it in a little glass jar. it’s sitting outside waiting for the fusion. can’t wait to taste it. Can one use empty baby food jars that have been put through the washing machine? Helen – Good idea! 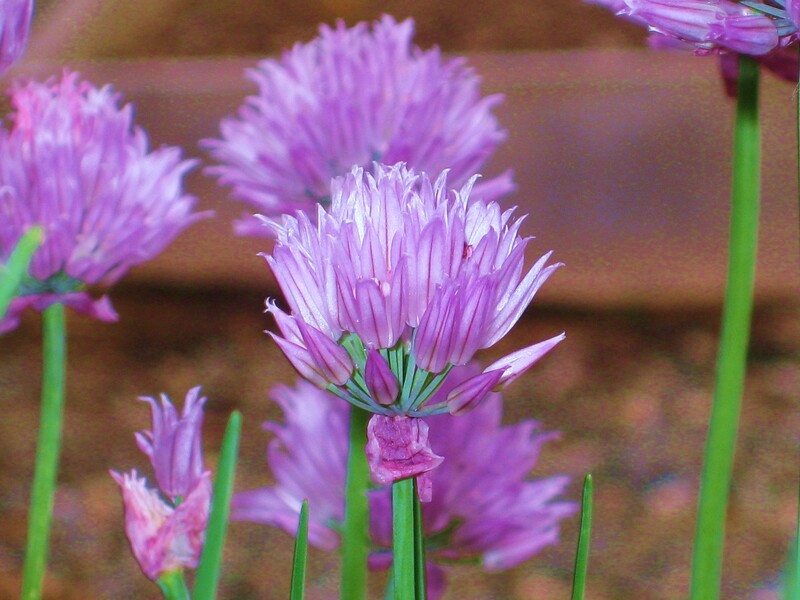 I hadn’t thought to use chive blossoms vinegar for mayo-making. Sounds delish. thanks Kevin, silly mistake – – -not thinking clearly this morning! What a wonderful idea! My chives, that survived our unusually harder-than-normal winter and picked right back up with growth a number of weeks ago, currently have these pretty little purple flowers on them. I didn’t know if I was to pick off the flowers or not, so now I know what to do with them! Thank you so very much, Kevin! I made it this year! I’m giving one to my mom and another to my bestie, and one for me. I love flavored vinegars and olive oils on salad. Thanks for the recipe! I haven’t done this in years. Thanks for the memory! Another exciting idea to try. Thank you! I’m off to the Dollar Store to find some pretty bottles and to load up on more vinegar! Thanks to everyone for their comments. I can’t wait to try this vinegar in mayo and potato salad. Garden on! I did this using Thai basel blossoms. It makes delicious vinegar and it also is pink. I shall have to try with chive blossoms too. Kevin – I made this last summer for Christmas gifts and it was a fabulous hit – so much so that I have had some not so subtly made hints for some from from family who received none. My newest batch is now becoming beautiful on my picnic table. Thank you so much! My chive blossom vinegar from last season patiently awaits your perfected Chive Blossom Vinegar Salad Dressing recipe. Have I missed it somehow? Might you be so kind as to post it again? Many thanks for ALL of your awesome recipes! I’m thinking this year I’ll try making it with garlic chive blossoms in August, then mixing it with the pink chive blossom infusion made in spring. That way I’ll have the best of both flavors while still retaining the pink color, albeit a lighter hue than the straight oniony chives. I am wonder how long the vinegar lasts? do you keep in the refrigerated or in the cupboard? Hi Shari in British Columbia – Chive Blossom Vinegar doesn’t last long in my house, because I use it frequently. But it should keep indefinitely. You can certainly refrigerate the elixir after you’ve removed the blossoms. Enjoy! I let mine steep for at least 2 months. I make gallons of it and give it away in jars for Christmas. The longer it steeps, the deeper the color gets. Try and be patient and let it go longer. It will be worth it. Hi Kevin. I recently signed on to your weekly newsletter and I made the chive vinegar. It is fantastic. I had no idea those flowers were so useful! I’ve been telling everyone about it. Next year I will certainly make more than one batch. I also learned from you more about removing the tomato “suckers” and I am on it! Be careful with the round shaped glass jars in the sun! I set my porch steps on fire this way. Sounds incredible but it happened. It worked just like a magnifying glass. I just decanted mine! It looks great and tasted wonderful. It will be part of a gift basket to be donated to my favorite charity auction. Thank you!